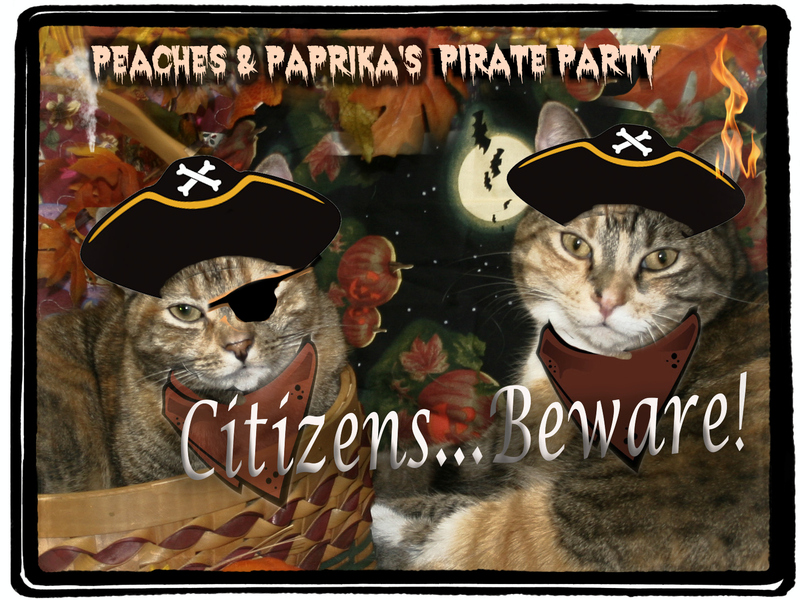 Mrowww...Mrowww....Since it's "Meow Like a Pirate Day" we did our best to look FIERCE and scary. . This is hard due to our sweet nature...did we succeed and scare you???? Ye surly rats be pirates fer sure, and we offer to meet in port someday to compare treasures! In the be-honorin of our trade of course. But guard yer treasure, First Mate Ayla has a light hand. I, Capn Marley, found me collar in her cot the day by and would have sworn I was still wearin it! Well done and you do look like forces to be reckoned with. Ye be rockin' the pirate pawty gang! Ye be very scary and fearsome pirates. Happy Meow Like a Pirate Day, cuties! Ahoy, mates. You do look fierce. Tee! Hee! If I was a MOUSIE I would be terrified! See you at the Pirate Parties! You succeeded! Happy Meow Like a Pirate Day! We were so scared ye were here to pillage our treasure then we saw how cute ye were and well...thanks for joining the Pet Parade! Ye have the look o' scary pirates, for sure! Make sure ye get plenty o' booty and swag once ye done terrorising the towns mice and drinking the taverns dry o' cream!! Yo Ho Ho and full sail to the wind me hearties, and enjoy the ride! Oh you to did make me laugh. What splendid Pirates you are!! Thank you for being part of the Thankful Thursdays with us, its much appreciated. Stay Safe During the Hurricane!